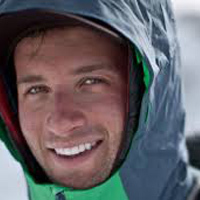 Brody Leven is a 28 year old professional skier/mountaineer now based in Salt Lake City Utah. 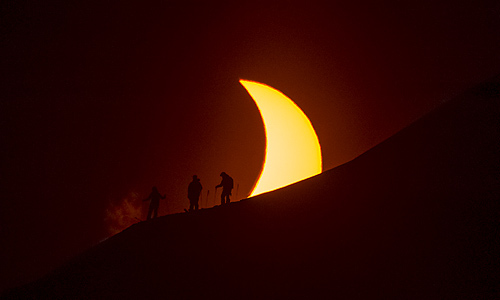 In March of 2015, Brody and the Salomon Freeski TV Team set out to film and document a photographer's goal of capturing a solitary image of a skier silhouetted by a solar eclipse. The group traveled to Svalbard Norway the only place on Earth where there was a good view of the Eclipse and a mountain with snow. 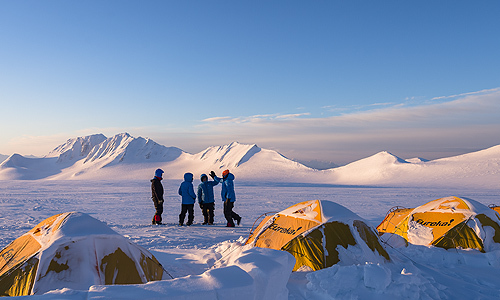 The trip to Svalbard took them inside the Arctic circle during one of the coldest periods of the year possible. They experienced polar bears, extreme cold weather and even saw a period of rain caused by climate change. Brody agreed to a short interview to give us some more details about the trip. After the world premiere for this film there was a whirlwind of press and interviews for you, thank you for taking the time. You grew up skiing in the Midwest and were at one point a freestyle skier, what is your focus now? I am as much of an uphill skier as a down hill skier, I really enjoy a variety of ski conditions from corn, fresh snow and all the way to firm conditions. I have skied all over the world and I really just like human powered skiing. I don't need lifts or helicopters to enjoy myself. 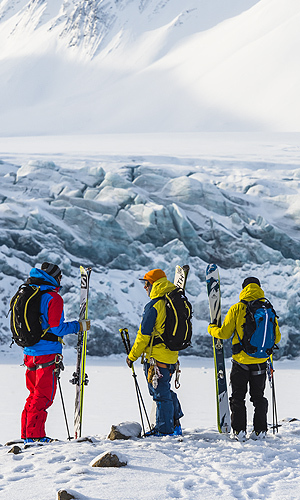 The three skiers, Brody, Cody and Chris enjoy a moment with a great view of the glacier and Svalbard mountains ahead. Powder is nice of course but I am more into exploring new areas and I am comfortable in all sorts of snow. When the snow is stable it might not be as deep but you can safely ski things that wouldn't be as safe with really heavy snow loads. On the Eclipse trip the snow was very manageable in regards to stability, that's an important factor when you are climbing and skiing down large features very far away from any additional support. Where is the most unique ski location you have experienced? Well, I have been lucky enough to ski all over the world, the arctic, north america, south america etc but Svalbard during the Eclipse was the most unique. It was truly an amazing thing to witness in those surroundings. I doubt that I will have that experience again in my life. 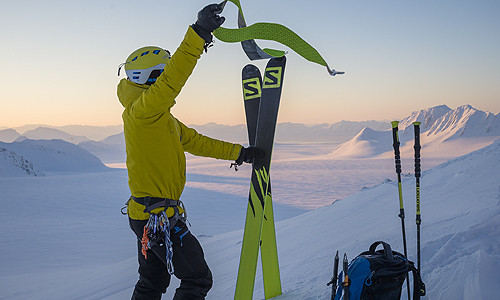 How long have you been an athlete with Salomon? I have skied for Salomon for two years. 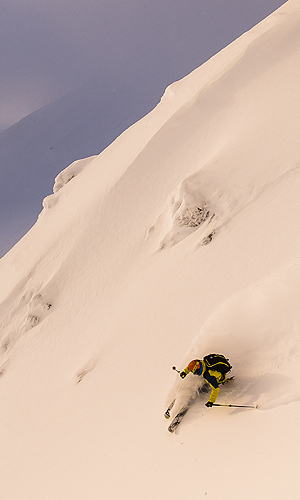 As a relative newcomer to the Salomon Team how did you end up on this trip? I was lucky that for this trip a few of the more experienced veterans on the Salomon Team turned down the trip idea because of the risks involved. Skiing in Svalbard with the goal of capturing people skiing during an Eclipse was a very rare experience and I decided to go because of that reason. Did you have reservations about going? I have skied in the Arctic before and I knew that there would be a very serious survival risk when it came to the temperatures we would experience. I also knew that the possibility of us not getting the shot was pretty high. I went because it would be something new, I had never skied during an eclipse obviously. Did you feel much pressure placed on the plan succeeding? Personally I didn't. Thing is, ski mountaineering/touring in Svalbard in -40F during a Solar Eclipse is a great story in of itself regardless of whether we got the photo that Reuben wanted. 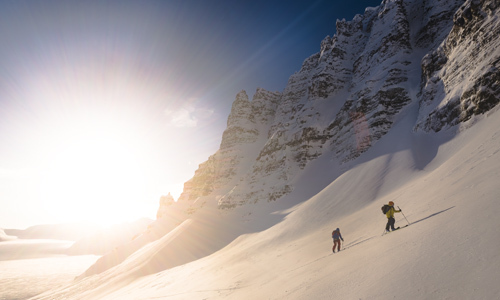 A Shot of skiers Cody Townsend, Chris Rubens, and Brody Leven on a ridge line in Svalbard Norway during the Solar Eclipse March 2014. Shot by Photographer Reuben Krabbe. During the film you made a comment that you would be unsure of how you might react to a possible polar bear encounter. Yeah, we did training with rifles as a precaution and also flare guns. I think that because of the fact that I am a lifelong vegetarian I would likely accept my fate if a Polar Bear did decide to try and eat me. The interesting thing about the flare gun was that the flares fire off 30 feet into the air and so the guide warned that if the bear got close and you used a flare you could cause the bear to run towards you if the flare exploded behind the bear. So after the training I decided that I probably wouldn't be using the rifle or the flare gun to protect against a polar bear attack. How long were you in Svalbard? We were in Svalbard for a month. We went to the Russian ghost town and then we were at Basecamp for 2 weeks on the glacier. Many of our early day were spent scouting for Eclipse locations. After the eclipse we managed to ski for another five or so days. After a rewarding hike up it's time to test the Svalbard snow. 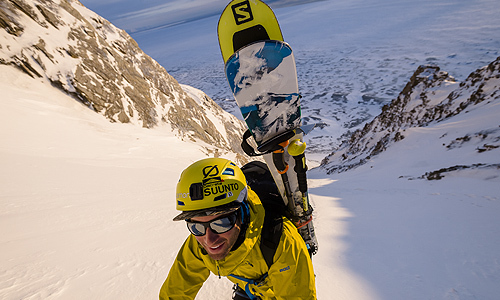 Brody Leven hiking up a couloir in Svalbard, finally getting a chance to go ski. What was something that the Eclipse film failed to show about the trip. I think that it was hard to show the struggle we were all going through in regards to the temperatures and the weather. We all had to be out in extreme cold, gear was failing, the camera operators had to keep warm too. During the Eclipse itself it was -40F and we were on a ridge top for over an hour. Everyone got frost bite. Staying alive was a very real challenge. We were very prepared for the weather with our base camp but all the times out filming tested everyone. Any other instances where you saw the risk involved? When Sten the assistant guide flipped the snowmobile on the lake I ran out to help without even thinking really. The ice was quite thin, everyone except one other person stayed back and we both just went out to help, not really thinking about the risk of the ice breaking, we all got lucky in that situation. Had the ice broken that would have be a big problem. So I noticed that you used tech fit touring bindings on the trip, is this something you always use now? Yeah, I have long accepted that tech bindings are the way to go for back country use especially. I trust them for all my skiing. There are lot's of people who feel like they need more beef out of a binding for their descents, but I really think it's a head game. If you feel like you need more there are companies out there that keep putting out new heavier duty products but I don't need them myself. 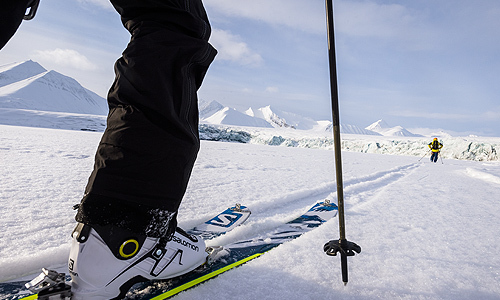 Out on the glacier with the new Salomon MTN Explore Boot and MTN Explore skis. Geared up and ready for anything with the new Salomon kit. Intense sun and views all around.